A multi-ethnic group of elementary age students are playing together with blocks at a table at school. The kids are talking and laughing together as they play. Math. Does that word bring a smile to your face or make you want to run into a corner and hide? Your experiences in school with math have probably solidified your answer to that question. As a teacher, it is my job to make sure that those early experiences with math are positive and make all my students smile! I accomplish this by making math fun. From a very early age children start to learn about math without even knowing it. Putting shapes into a shape sorter, placing pieces into a puzzle, and adding berries on a string are all ways that we can introduce math to toddlers and preschoolers. Children learn math best by touching and physically “doing” math. In my classroom when we learn about shapes, we build shapes and angles out of straws and twist ties. We demonstrate what a polygon is by lying on the ground and making one out of our bodies. We add physical activity to math by doing jumping jacks when we answer our math facts. These activities make math fun. A common misconception about math is that it is all rote memorization of numbers and topics. This is not the case! 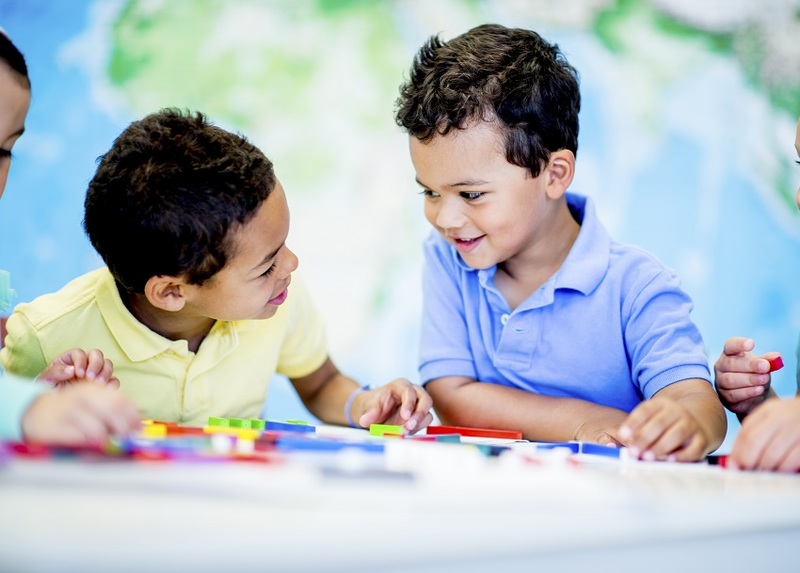 Students who understand what math is and how it works have something called a strong “number sense.” Number sense refers to how well a child understands what a number is and what makes up a number. To learn how numbers can be taken apart and put back together, math needs to be a hands-on experience. The use of manipulatives in the classroom and at home can help with this. In this classroom we use cubes, dice, base 10 blocks, and counters so that students can not only feel what numbers look like but can visualize the numbers as well. At home this number sense practice can be achieved by playing games. In a game like SimplyFun’s Share a Berry young learners practice counting, adding, and subtracting by moving berries on and off of their string. A simple everyday task like washing grapes can also easily turn into a math lesson for your young learners. As you are washing the grapes, count each one out loud and have your child place them on a paper towel. Pretend to hide a few grapes and count how many are left. Your child won’t even realize that they are doing math. Lastly, make sure to always have a positive attitude about math. There are so many new ways of doing math these days and your child will probably not be learning them the same way you did. That is okay! These new ways present the perfect opportunity for your child to be able to teach the topic to you, thus strengthening their understanding of the topic. When playing math games, don’t treat it as a chore, treat it is an opportunity for your family members to have time to learn and grow together, while having fun! Written by Sara Lang, 3rd grade teacher, De Pere, Wisconsin.